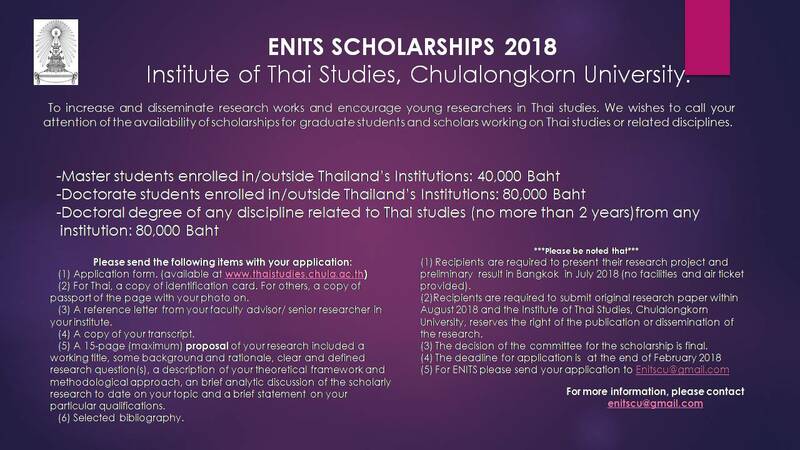 The new ENITS Research Scholarship is now available at Thai Studies Institute Chulalongkorn University in Thailand. Scholarships are available for Thai and International students. Thai Studies Institute Chulalongkorn University was founded in 1975 under the name of “Thai Studies Project” under the Department of Academic Affairs. “Thai Studies Institute” operates under the office of the University. On February 1, 2010, it was designated as Research Institute No. 9 according to the Announcement of Chulalongkorn University’s Department in the Government Gazette. Thai Institute of Education has a policy to excel in the creation of knowledge and research Thai-Typhi both national and international. Course Level: Scholarships are available to pursue research for Master and Doctoral students. Study Subject: Scholarships are awarded in Thai Studies or related discipline. Nationality: Scholarships are available for Thai and International students. Eligible Countries: Scholarships are available for Thai and International students. How to Apply: Recipients are required to submit an original unpublished research paper related to Thai Studies and give an oral presentation in Thailand. The Institute of Thai Studies, Chulalongkorn University reserves the right to publish or disseminate the research papers. (2) For Thais, a copy of identification card. For others, a copy of passport (the page with your photo on). (3) A reference letter from your faculty advisor or the senior head of your research project. (4) A copy of your transcript. (5) A full paper of original research work related to Thai Studies.